Michelle is the Founder of the Institute for Applied Positive Research and is partnered with Arianna Huffington to study how transformative stories fuel success. She is an Executive Producer of “The Happiness Advantage” Special on PBS and a featured professor in Oprah's Happiness course. Gail Davis: Today's in-studio guest is Michelle Giellen. 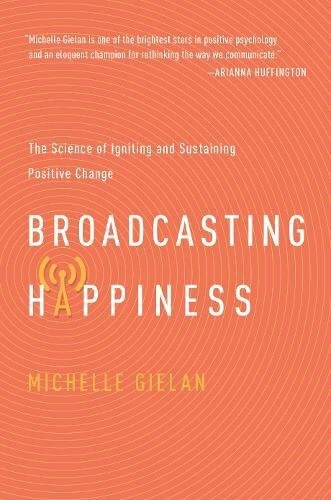 Michelle is a national CBS News anchor turned positive psychology researcher and bestselling author of broadcasting happiness. [00:01:00] Michelle is also the founder of the Institute for Applied Positive Research and has partnered with Arianna Huffington to study how transformative stories fuels success. She is an executive producer of The Happiness Advantaged Special on PBS and a featured professor in Oprah's happiness course. Welcome to the GDA podcast. Michelle Gielan: Thanks so much Gail. I'm so happy to be here with you. Gail Davis: We always love it when Michele stops by because it's like a burst of sunshine gives walking into the office her smile, and now [00:01:30] you can't see a smile on a podcast, but she's got the perfect smile for happiness researcher. Gail Davis: Why don't we start with how you made this shift from media to positive psychology and research and becoming a happiness expert. Michelle Gielan: So I was working at CBS News and had such a fantastic opportunity there to anchor two national news programs. But I got very quickly tired of telling negative news stories. I think at this point I can say I have a Ph.D. in making people [00:02:00] miserable. But more importantly what I started to be very curious about is how can we talk about serious negative events not just on the news and in the world, but in our lives around the dinner table, in our businesses in a way that doesn't leave us feeling helpless and hopeless instead leaves us feeling empowered, resilient and ready to take action to solve these challenges. And so I stumbled upon positive psychology which is a scientific study of happiness and human potential and [00:02:30] seeing that ... Originally I was an engineer, so I love the science aspect of it. And and to see how applicable it is in our businesses and in our own personal lives. For me, that was the defining moment, and I left CBS, and now I'm a Positive psychology researcher. Gail Davis: If I were to tell someone hey I have a happiness speaker, it can sound kind of fluffy. So it's really interesting that the really is science to back up all of the things that you speak about? Michelle Gielan: Yes. And I'm [00:03:00] so happy to see that there is so much data coming out of the top academic institutions and basically the thesis the theme of it is that a positive brain fuels performance at work in our educational systems and in our relationships. When our brain is more positive, optimistic, and resilient, we see that it improves business outcomes like profitability increasing it by 50%. Decrease in the negative effects of stress like headaches, [00:03:30] backaches, and fatigue by 23%. Increasing sales of your sales professional by 37%. It makes such a tangible big difference. And now with our clients, we see when we start implementing these positive psychology strategies I mean the business results have been incredible. Gail Davis: Are there takeaways for people in organizations that tools that they can use to shift to create a more positive environment? Michelle Gielan: Yes. So the exciting part I think [00:04:00] the best part about all of this research is it points to the fact that our mindset is malleable. And the things that we can do to shift our mindset from a more stressed or negative or helpless state to that more positive state are very very simple. Oftentimes when I give presentations at companies, the first strategy I share is this idea of the power lead which ... So this is taken from my days in media. The old adage on TV with news for the top [00:04:30] stories, "If it bleeds it leads." That's what they follow right. So for our own personal broadcast and our own top story as we talk to people and have conversations with them, we want to take the opposite approach. So I mean think about it. As we interact with other people, what's our top story? What are we talking about? Are we "I'm busy." "I'm tired." "I'm exhausted." "I'm stressed." Here's the horrible thing that happened to me today. Or are we sharing information that is positive [00:05:00] and meaningful? So the power elite encourages people to do that. Share the first thing in the conversation. Make it something positive and meaningful. The reason that so powerful is a you're taking the lead on the conversation, you're encouraging others to match in kind. And ultimately we're building deeper levels of social connection with our colleagues and our family members when we use the power lead and make that move. Gail Davis: Speaking of family members, when you say that I think of my mother. And [00:05:30] when I call her she always is so happy to hear your voice. And it makes you happy you called. And just this whole happy conversation takes place. Not to say that people don't have things going on in their lives but, I always think to myself after I hang up from her. I hope people who call me is happy that they did that. So I think that's really a really valid point. Also, I'm curious I know you and your husband have a son. What things do you implement [00:06:00] into day to day family life that can benefit your family in terms of these same strategies? Michelle Gielan: Well, I think we're very conscious about how we interact with one another, about certain specific topics. Like when we talk about work. Are we talking about in a way that would make our son believe that we're just stressed about it all the time, or we feel uncertain about it or do we talk about work in a more empowered way? So [00:06:30] because he's learning lessons from us. He's watching us, and as you know children are Geiger counters, they just mimic what they're feeling. And so if we are are talking about work in a way that is not as empowering I think then he might learn to have that framework about work when he goes to the office years from now. And the other major thing what we try to do with our son ... And listen we're a work in progress. He's only three and a half. We'll see what happens. [00:07:00] But for us, the other major thing we try to do is help build a self-concept for him of being a good person, and a helper and all these wonderful things that you want from your child. We are constantly pointing out in very specific ways, for instance, things that he's done to help someone else. Oh, we saw you picked up that toy and brought it and put it in the toy box. That was really helpful. I think managers can do this with their team members [00:07:30] if you're seeing something, say something. Just like they say at the airport. If you see something say something. Well, let's use it for a good right. If you see something that's happening at the office something that is very tangible and specific that a colleague or team members doing. Call them out for it. Kyle Davis: So I had a mentor of mine when I was working like a decade ago or so, that he used to grab me and when we would have our conversations and then coach me you would not have conversations with people I was managing. [00:08:00] You'd always tell me to do Oreo psychology and start with something good. Go in with something bad and with something good. And that's probably the most simplified version of kind of what you're talking about when it comes to positive psychology and how we start a conversation and how we end it. So transitioning that into business. I mean how were people able to have these more powerful conversations that really equate to more efficient conversations or increased [00:08:30] productivity or anything else from it. Something probably more complicated than the simple Oreo. Michelle Gielan: Well so I say first and foremost you got to serve Oreos at these hard discussions. No, but what I think is the cornerstone to having whether it's these type of performance review, discussions or really any time you're interacting with people at work. You have to be authentic. It's very important to be authentic [00:09:00] right. So I think the Oreo framework can be good because you say okay, well I know sort of the pieces to this conversation. There's a flow. But really the authenticity ultimately I believe built trust among you and the other person. In the work we're doing, we've looked at how managers can fuel higher levels of trust with their team members. And one major thing we found ... So I did a series of studies with Arianna Huffington looking at [00:09:30] the impact of information on our brain and in particular cognitive functioning. What we found is that if you simply expose someone to a problem, like so let's say a manager comes into a team meeting and says we've got a big problem. Here is what's going on. And you leave them there you actually negatively impact their performance potentially for the rest of the day. Meanwhile, if you move the conversation from merely discussion of problems to what we can do about it right, get the team brainstorming, suggest potential [00:10:00] or actual solutions. You make them smarter and better at subsequent unrelated tasks later in the day. And so it's those small moments that not only impact their performance but also build that connection, build that trust so that they're not just looking to you in good times to celebrate but they're looking at you as a good leader in the midst of challenging times as well. Gail Davis: I think that's key. I know that yesterday I was ... I'm a member of EL. The entrepreneur organization. And [00:10:30] we have forums where people share what's going on in their businesses. And sometimes being an entrepreneur is tough. And one of my colleagues was talking about a challenge she was going through, and we all just rallied around her and said "You've got to see the positive where this can go because your team is going to be looking to you for that reaction." And so I know that it's easy to see when it's someone else but sometimes when you're in the midst of it, [00:11:00] it's more difficult to remember how important your positive take and your vision for the future can impact the overall happiness I guess. Michelle Gielan: Yes. And that's social support from the team is I mean I want to say it's invaluable, but you can actually quantify it. So we did some work with a large insurance company here in the US, and we worked with them over an 18 month period where we ... Oh my gosh this is crazy, but when we walked into the company and met with the president, he [00:11:30] literally called happiness research fluff. That's a tough crowd. So we presented him with a data-driven case to why can be profitable to an organization to invest in the well-being of employees right. Sort of intellectually and intuitively a no-brainer. But here's the data. And so he said okay well let's try it out. So what they did was they rewrote their playbook. So basic business practices they infuse the research in it, and then they [00:12:00] started trying everything out. I'll give you one example, and it speaks to the example you were talking about. They did something called "The morning huddle." So they got everyone off the phones. These are sales professionals. Got them to meet together first thing in the morning for just about 10 minutes to do two things. They wanted to talk about and celebrate successes from the past 24 to 48 hours the entire team might not have heard about and then they also wanted to give anyone who needed a little extra support [00:12:30] that day a chance to speak up. Their colleagues could rally around them and help them out. Right. So simple. By the way, I gave a talk at Google's rework conference, and it's just the kind of right mix of CEOs and thought leaders and like it's invitation only it's just like the right mix to make you totally nervous. They gave me ten minutes. I practice like crazy. And then I get up there and I start talking about the morning huddle, and I call it the morning cuddle. [00:13:00] So the videos on YouTube. You can look it up, it will be there forever. So anyway, so. Gail Davis: That could probably really promote happiness. Michelle Gielan: True, true. It's a good laugh. I'll tell you that. Kyle Davis: But also started HR investigation. Let's be careful with the cuddling people. Michelle Gielan: So the huddle and a handful of other things. So we track the results over time, and they were doing nothing else different [00:13:30] during that period of time. What we found is at the end of that 18 month period they reported a 237% increase in the new insurance application rate and a 50% increase in gross revenues. And that was to the tune of hundreds of millions of dollars. And that same president by the way that gave us grief in the beginning. Now he's the biggest champion of positive psychology research and totally credits all the work that they did along those lines to improving their [00:14:00] business. Michelle Gielan: So the exciting thing is [00:14:30] that this is all applicable across industry. We have now ... We did, for instance, started with training magazine looking at the impact of expressing one's more positive mindset especially in meetings or someone's presenting an idea on the culture. And we found that the numbers held pretty much constant no matter the industry, no matter the role that someone has. You can apply this research at any level of the organization which to me it [00:15:00] answers a very big sort of insecurity that I think especially people who are in the earlier stages of their career have. They might say Well, I don't have an official title that gives me managerial abilities here, or I can't really influence the people around me. Well, actually you can influence people within minutes, and the more we practice these kind of techniques the more we prepare ourselves for when someone is ready to give us that [00:15:30] promotion. As a matter of fact, one of the metrics that we test for using this assessment that we developed that is a predictor of long-term levels of success is something called the support provision which tests for how much do you support the people around your organization? And we found that the people who scored in the top 25% of that metric cross-industry they were actually 40% more likely to get a promotion over the next year than the people in the lowest quartile. Didn't matter their level at the [00:16:00] organization. They still improved their chances of getting recognized. The more that they were supportive of the people around them. Kyle Davis: Kind of like going back to that like other like segments of companies let's say it's like customer service when you look at them are you starting to see like improve like customer satisfaction or like I hate seeing like NPS Net Promoter Scores or those different things. But what are people ... How is this impacting the entire organization [00:16:30] aside from top-line revenue? Michelle Gielan: Retention I mean. And then the positive the ratio of two to one. These are mid-performance teams, and one to one is low performing teams. The only difference there that they test on all kinds of dimensions it was really only how positive they communicated with one another and how supportive they were. Kyle Davis: So kind of circling back to some more really two words that you mentioned earlier about authenticity and trust. I mean you said that I think a lot of people may [00:17:30] look like happiness, they're kind of viewed as fluff science. I mean because honestly if we all meet happy people, they can be annoying sometimes. But happiness doesn't have to be like a cheerleader of pompoms it can be something very different. It could just be happy to work for somebody that you respect and they're not lying to you. So how important are those two factors of authenticity and trust? And what can leaders do to help build that in the long term? Michelle Gielan: Love them. I love him too. And people would say to us oh married pair of happiness researchers. You guys must be the happiest couple in the world. I was like well we're not happy all the time. That's actually a disorder. We don't study people like that. And so what we're really [00:18:30] striving for is being authentic in creating a more positive mindset. It's communicating that with other people. But I think back I don't know if you had this experience but when I was in high school, the piece of praise that I remember from all of high school the most was actually not a pom pom rah-rah cheer leading kind of praise. It was my physics teacher turning to me, and [00:19:00] he pushed my exam across the table, and he goes "You did a really nice job on this." Right. Serious, direct, specific, and that stuck with me. I was like great I think I might be able to do some physics here. So definitely this while we call it happiness research it's not meant I know I'd never want to encourage people to get too far out of their comfort zone in terms [00:19:30] of high energy and all of that stuff because then that loses the authenticity and trust. Kyle Davis: Right. So it doesn't have to be rainbows and unicorns every day? Michelle Gielan: Those things I think they're good. Gail Davis: So there are occasionally on some teams or in some families negative people? Gail Davis: And so what techniques do you have for how to maybe [00:20:30] diminish their power or to work with them and change the dynamic? Michelle Gielan: I've dedicated an entire section to negative people in my book. So one thing that I found very encouraging from the research a lot of people ask me well who's more powerful? The positive person? Or the negative person? In setting company culture. And I know why they're asking right they're thinking of you go into a meeting, and there's that one negative person that tears [00:21:00] apart everyone's ideas, you leave drained. You don't want to go back, and they're just toxic. So I looked at the research and here's what I found. It's actually not the most positive person who's most powerful, but it's not the most negative person either. It's actually the person who's most expressive of their mindset. And so the more that we as people who have a more positive mindset or have been more mindful about being positive with other people, the more we can [00:21:30] express it the more we model that behavior for other people, and give license for them to be more positive and expressive too. And so I mentioned that the work we did with training magazine. One of the most interesting findings out of that study was that 31% of people across industry were actually optimistic. They just weren't expressive of that mindset. So that means let's say you go into a meeting and you present an idea. There's one in three people around you who actually support your idea, but they're not saying anything. [00:22:00] So the more that we can get those people to speak up and we create a culture of support. Of course, they don't want bad ideas. We want to be able to be critical when necessary but we there also needs to be that positive balance then you drown out the toxic people, and they don't have such weight at companies. Gail Davis: That's great. I think for me, I'm probably more of a glass-half-full person. Michelle Gielan: You definitely are. Gail Davis: [00:22:30] I equate that to happiness. But I think for me in this busy Harry scheduled world, when I am relaxed and when I am refreshed it's so much easier to be happy. And I just saw an article that someone in my office pointed out to me that you and your husband Sean, who you mentioned, wrote about how to enhance the culture. I think this was specifically about home and family so that you can relax and refresh. Do you want to [00:23:00] talk a little bit about that? Because there were some great takeaways like this stakeholder meeting and something about a Ziploc bag I think I remember reading. I think there's some great takeaway there for everyone listening. Michelle Gielan: So you'll need a pen, paper, a Ziploc bag, neither we were banned. So this idea was born out of a lot of questions that we got from people saying basically along lines of "I'm stressed" "I'm exhausted" or my partner, my spouse is stressed and exhausted and [00:23:30] what can we do to help? I mean I felt this personally with Sean is and I know he has with me too. You look at somebody else they're feeling stressed and there's you just want to help right. You just want to do something that can change the environment at home. So what we started to look at was, are the companies who are actually doing really well creating positive culture, what can we learn from them? That could help strengthen a [00:24:00] better culture at home? And if we strengthen a better culture at home, then maybe we can give a chance for ourselves and our significant other to relax, recharge and go back to the office fresh. And so some of the ideas that we present in this article are about hold a stakeholders meeting where you get everyone in the family who is old enough to meaningfully contribute around a table to talk about what does it look like around our house in the evenings and weekends [00:24:30] when we all want to be together, and we want to create a culture of peace and relaxation. What do we do? Decide on family values. What are the values wrapped around this topic that we want to expose? And then technology plays a huge role in this. If your phone's going off constantly with work e-mails and it is 7:00 pm at night you're probably not giving your brain a chance to unwind and decompress. So can we put it in a little baggie? So this is where this all came from. We experimented with Put [00:25:00] it in this Ziploc bag because what happens is we so often unconsciously will just grab the phone and not even think about it. And before you know it our noses in that e-mails again. Right. So instead put a little physical barrier between that. And I think that those ... And then oh, and you mentioned sleep, I had to call it sleeping your way to the top. But fascinatingly we write more positive memories than negative ones when we are well-rested. [00:25:30] So if you want to feel good hit the hay it's just more worries I mean I know that sleeping well obviously everyone's talked about it, but this is just one more reason to get to bed early. Brush your teeth in front of your partners. They know it's time for bed. Go to sleep. Gail Davis: Do you have any tips on how to share bad news? Michelle Gielan: Yes. So bad news. It's a natural part of life. We have to do it. But I think that I mean I think the it goes kind of back to what [00:26:00] we're talking about where we are just presenting problems or are we presenting solutions. And then if you see that either you are feeling stuck or the other person that you're talking to is feeling stuck, then the key there is to get them to do what I call a now step. A now step is the smallest meaningful action that might not tell the whole problem, but it'll just get their brain moving forward and get them taking a little bit of action. So I'll give you the practical [00:26:30] example. Let's say your friend meets up with you at a coffee shop and says I need a new car. So great. You need a new car, so therefore you probably need the money and right. So if you turn to them and suggest Well I think that you should go get a master's degree, so you could get a new job, so you could earn more money, it's just like ridiculous right. Those are long-term solutions there. Meanwhile, a now step could be, how about instead of buying that grande vante chocolate sprinkles [00:27:00] on top coffee for $5. Why not just buy a dollar a cup of coffee and save the four bucks towards a car. Or they could put in an application to work at that coffee shop for a few extra hours a week to earn a little more money. Or maybe their uncle has a car sitting in the driveway that he's not using very much. Maybe you can borrow it for a couple of weeks, and that would tide you over and help you. The key with this it's not about the action as much as about giving your brain that win, and if we give our brain that win, then we feel good. And the dopamine [00:27:30] hits our system, and then we want to take that next action and that next one. And so hopefully it Spurs a more permanent solution. Gail Davis: Earlier in our conversation you were talking about calling out your team members when you see a positive behavior. And yesterday we had a little blip on some logistics which happens occasionally. And the person came into my office and just said this happened, this happened, and here's what I think we ought to do. And I just immediately said [00:28:00] your poise, your composure, your facts. I'm so impressed with the way you handled it. And yes I love your "This is what I think we should do." And I like the part of bringing a solution. So anyway I just have really noticed that I wanted to mention it because I think it's so important for people to do that. Michelle Gielan: I think people like that are so awesome. So we worked with this guy who ran a multinational company. He told us one day that he was so tired of people just coming to him with problems [00:28:30] that he actually got to a point where he became known at the company for if you just call him for with a problem he's going to hang up on you. I'm not kidding. He hung up on people that he worked with. And then he but after a while trained them, you don't call me with a problem. Call me with the facts, and call me with a solution. Gail Davis: It's really good. What's next? I mean what are you going to do? I mean where do you take this melding of your broadcast experience with your happiness research. Are there new topics or areas that [00:29:00] you're looking at? Gail Davis: Ninety one percent could stress better. Michelle Gielan: Could stress better which probably and I'm sure includes me. And so it was really along three dimensions. Are you an open communicator meaning do you bottle it up which is not predictive obviously of good outcomes. Or do you talk to too many people which actually is not [00:30:00] good either. Do you have maybe one or two trusted advisers and do you open up to them when the situation warrants? The second domain we looked at was, do you get riled up? Or do you stay cool under pressure? Obviously being cool under pressure is the better response. And then do we ruminate and think about the problem over and over and over? Or do we very quickly get to an action plan and start with a now step for instance. So there is one category which I [00:30:30] loved. So we originally developed this is part of The Dr. Oz Show and we were working with the series producers, and I said okay so we're naming one category the five alarmers, all of them we're like that's me, that's me, I'm a five-alarmer.So the five alarmers not necessarily cool under pressure, and they're talking to a lot of people, but they actually get a game plan going pretty quickly. So two out of three. But anyway so what we found though ultimately [00:31:00] is that of all all three of these dimensions they're malleable and if you just practice having the confidence and staying cool and getting to that now step, you can actually improve your default response to stress. Michelle Gielan: It's so true. And we did a study with UBS with stressed-out managers there are a handful of years ago. And so with one group, we trained them, it was basically a typical stress management training that you might receive at any company with [00:32:00] the experimental group of managers. We put them through something called Stress is enhancing which means like what but we pulled very accurate, equally true, data points from the literature that showed that stress can actually be good for you can enhance your cognitive functioning, your mental agility, your memory, your energy and all kinds of other things. And then we train them on how to see it own it and use it when they encounter a stressful situation. [00:32:30] And then we tracked them over time four months later the company is going through a very stressful experience. And as a whole the managers in that experimental group who have rethought their relationship with stress they were the ones that reported a 23% drop in stress-related symptoms like headaches, backaches, and fatigue. So what it tells us is that first of all I do not advocate going out and looking for more stress. That is not the story. But when we are [00:33:00] stressed if we can see the stress coming down the pipeline, recognize that we feel that way and then get our brain to that action plan that we want to take. It changes our response. Gail Davis: Perfect. Well, that sounds like a good place to me for us to wrap up. Do you have anything else, Mr. Kyle? Gail Davis: I love it, Kyle. I think you and I were going to come up with the family stakeholders meeting. Kyle Davis: No we're not. Michelle Gielan: Your alones going [00:33:30] in a bag. Gail Davis: Your phone is going to go in a bag. He would be okay with that. Michelle Gielan: I'll get him to put the phone away. He can do that. Kyle Davis: My friend says you don't disturb all day. Michelle Gielan: Oh my gosh you're my hero. Not literally. That's incredible. Kyle Davis: I want to talk, I mean give the microphone. I ask questions, remove mic your hollow voice in the background. [00:34:00] I have a Belgian Malinois. So it's like a German Shepherd but better. Michelle Gielan: Nice. Very cool. Kyle Davis: He's hyper. He doesn't exercise day to day. So we'll see what kind of destruction I walk into. So I'm stressing right now. But I'm cool about it. Michelle Gielan: You're cool under pressure. Kyle Davis: Anything that he does wrong is really my fault. That's true. Michelle Gielan: That's true. I say that about my son. Kyle Davis: I mean but working out I like getting on my mind, and into my body, I think that's helpful [00:34:30] you stress up a lot. And other than that people should just listen to make some noise right. So yes. But no, no family meetings. All right cool. All fun aside. It was really good to have this conversation, and I think a lot of people will really enjoy it. I really have nothing else to add. I think it is great so with that being said, thanks.